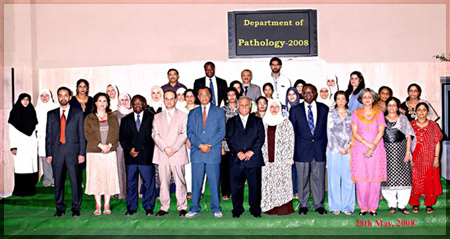 The department of Pathology provides the bridge between basic medical science and the clinical sciences. As the custodian of the scientific basis of modern medicine the department guides students of medicine, dentistry, pharmacy and allied health professions to an understanding of the scientific basis of health and disease. The department strives to stimulate students’ curiosity and imagination, and challenges them to contribute to the advancement of knowledge in clinical, translational and basic scientific research germane to medicine. The staff of the department comprises highly qualified, very experienced expatriates and Kuwaitis dedicated to the advancement of teaching, clinical practice and research that should enhance the practice of medicine in Kuwait.